The decision to exhibit Supper in Emmaus, a work by Guercino, in the Museum of the Ancient Delta, is part of a cultural project that has long been promoted by the municipalities of Cento and Comacchio. According to the ancient world’s concept of distance, although these two places were not close to each other, they were connected by waterways. Not until the early 1500s did they begin to share a common history when Cento also became part of the Duchy of Este through Lucrezia Borgia’s dowry to Alfonso d'Este I, which included the Emilian town. The duchy was transferred to the State of the Church in 1598, and the town thus became part of the papal legation. Although sometimes taxing or even oppressive, the pope’s legates also directed the development of the territories entrusted to them. This happened in Comacchio where the Papacy commissioned construction works to reshape the town, giving it a new urban look that included erecting the Ospedale degli Infermi. Its monumental structure rises elegantly above the typical, low edifices that flank the canals in this lagoon town. Until the early 1970's, the hospital provided health care to the community. Today it is home to the Museum of the Ancient Delta. Today Cento and Comacchio have joined together in a cooperative initiative to launch the new museum as a place not just of culture but also as one where culture is created, despite the museum’s institutional origins. Thus, Cento is offering an opportunity to appreciate in a different setting a masterpiece normally displayed in its local art gallery and in conjunction with the opening of the XIX Eel Festival (Sagra dell’anguilla), a long-standing, highly popular food and wine event. 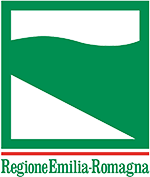 This initiative wishes to create an ever broader network of relations that offer incentives to an increasingly receptive and prepared audience, through a shared experience that will introduce them – in this case, at the dinner table – to art, archeology, history, and gastronomic delights. With his unique and unmistakable style, Giovanni Francesco Barbieri, known as Guercino, (Cento 1591 - Bologna 1666), is one of the protagonists of Italian Baroque painting. His early works are characterized by a strong, masterly use of light and shadow, intense color contrasts, and a style of painting a macchie, with splodges of color, which sprang from Venetian tonalism. Guercino looked towards painters from Ferrara, like Scarsellino and Bononi. However, he was strongly influenced by Ludovico Carracci's art. From the latter, this Cento-born artist developed a way of understanding art as popular communication, a humanization of the divine, a language of gestures and looks, and the simple, naturalistic representation of feelings. His works before 1621 underscore his great skill as a colorist as well as his dynamic compositions, unique sensitivity in rendering the figure-space relationship, an unpretentious realism of faces and gestures, and the atmospheric vibrations of Guercini’s characteristic landscapes. In 1621, Guercino was invited to Rome by the new pope, Gregory XV. During his two years in the Eternal City, the artist carried out works characterized by bold compositions, unusual perspective views, dynamic gestures, and illusionist visual effects. Yet he nonetheless vigorously faced the attractions of classicist painting, particularly Domenichino. The results of this influence can be seen in his works from the late 1620s, a transition period during which simplified compositions, more controlled gestures, serene and harmonious spaces, and aristocratic features were introduced. These works reflect Guido Reni’s idealism and anticipate the master’s late pictorial period of classicism, which began in the 1630s. In works from this late period the contrasts of light and dark and the "gran macchia”, large splodges of color, were eliminated. The gestures became noble, somber, and composed. Perfect features, grace, idealization, and serenity dominated the solemn, monumental compositions. Guido Reni's death (1642) was what pushed Guercino to move to Bologna. There, the artist intended to fill the void left by Guido's passing and to thus inherit the commissions. Guercino died in Bologna in 1666. He was buried in the church of San Salvatore, where he still rests today, next to his brother Paolo Antonio. 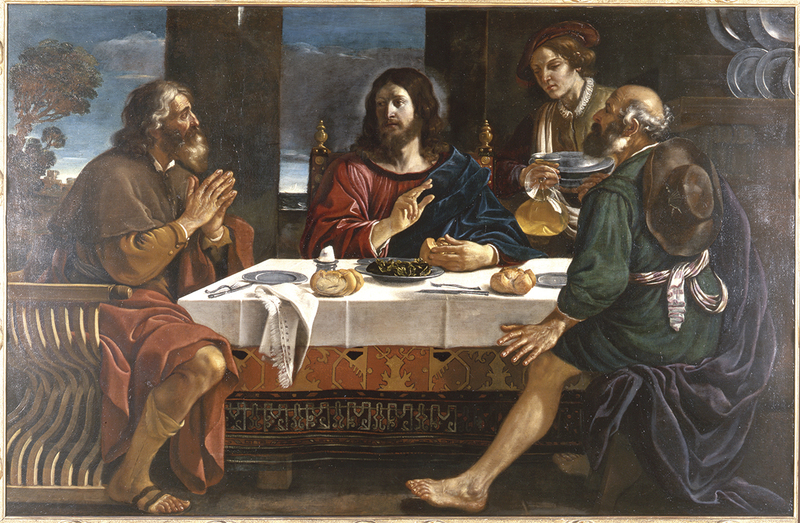 Supper at Emmaus is thought to be a studio work, albeit one derived from a specific design, and whose production was constantly overseen by Guercino himself, as one of his preparatory pen-and-watercolor drawings, now in Stuttgart, confirms. A studio-produced composition may have been an inevitable choice since the prior of the convent commissioning the work had a very limited budget with respect to the cost for a work painted completely by the master. The canvas depicts the gospel passage in which Christ, on the very day of his Resurrection, meets two pilgrims on the way from Jerusalem to the village of Emmaus. Although they do not recognize him, they invite him to stop at a house in Emmaus. The sacred texts describe the revelation through the simple gesture of blessing the bread. Clearly it is the moment of recognition that causes a startling surprise, with one pilgrim looking on in amazement while the other prays. Though the host is witness to the event, he remains absorbed in his duties. This gives the painter an opportunity to display his skill, with the transparency of the glass goblet held in the same hand as the bottle of wine. It is a theme typically worthy of a Caravaggesque interior. Here, however, the space is divided between the inside and the outside with the artist having placed openings onto both a seascape and a rural landscape. The sky is growing dark, consistent with the episode’s taking place towards evening. Moreover, the still-life passages are extraordinary: the freshly laid, white tablecloth with its very visible folds, the still empty metal plates, the typical local bread not yet cut, the knotted fringes of the napkin resting on the edge of the table, and, in the center, the dish with its enigmatic contents, perhaps mussels, mushrooms, or figs.